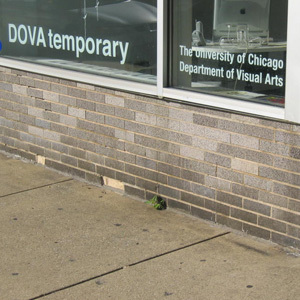 DOVA Temporary is a storefront gallery administered by the University of Chicago’s Department of Visual Arts (DOVA). Its primary goal is to provide a professional quality facility for the exhibition of graduate, undergraduate, and alumni student work from DOVA on a regular basis. In addition, the gallery hosts exhibits and events organized by a wide variety of arts-affiliated groups and individuals, both within and outside of the University, that fall outside the program of other, more traditional venues on campus. By virtue of its location in Hyde Park’s historically significant Harper court, it serves as a point of interaction and engagement between the Hyde Park community and the Arts on campus. DOVA Temporary is a highly adaptable space that fosters experimentation and diverse approaches to the arts.